Greetings! Although I am on the schedule to host today's Poetry Friday, I have traded with Betsy Hubbard over at Teaching Young Writers. So...if you are looking for today's round up, please head over to Betsy's place. I will host here at The Poem Farm on November 30, so if you keep the calendar in your sidebar, you may wish to make this change. Thank you, Betsy, for trading with me! Students - I am a big sister. And I have a wonderful little sister who isn't so little anymore. We're great friends, and I feel extremely grateful to have her in my life. I am also a mom of three fun and funny children, and all of these family relationships make me think about the magical and the worrying aspects of being a sibling. 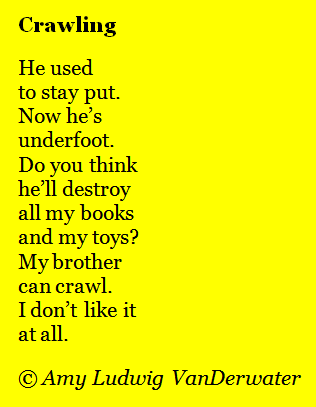 Today's poem is a bit of a worry, perhaps one that came from watching our two older daughters watch as our son learned to crawl and get into things. Are you an older sibling, a younger sibling, both, or an only child? No matter which you are, there's a lot of poem food in there. Pay attention to your relationships with your siblings. Think about what it is like to be an only child. What do you love? What is difficult? These may be good ideas for poems. When I write from my life, I am careful to be sure that my words do good and do not hurt anyone. You may wish to think about this too, whenever you write about people you know. Our words hold power. Remember - it's Poetry Friday today, and we're celebrating over with Betsy at Teaching Young Writers. Have a beautiful poetry weekend! At Write. Sketch. Repeat. I've got Kipling's The Vampire which inspired the first vampire movie. Such a sweet poem. Love the baby foot :). Baby feet! Adorable poem and reading, Amy! Perfect! My 2-year-old might end up with a younger sibling one day, and I'm sure he'll be thinking the same thing! Hi, Amy. I am a big sister also. One of my "little" brothers now has a big girl (age 5) of his own with a just-walking brother. I'm looking forward to sharing this poem with them. You are so right about words and their power. You offer a nice piece of advice to your students today when suggesting that the power of words be used for good. I always love my visits to The Poem Farm. Thank you for the sweet "little" poem too! Hi Amy, alas, I am an only child, so a lot of this escapes me. I can only imagine seeing a younger sibling go underfoot, crawling most everywhere. Thank you for sharing with us your inspiration for this week's poem. Love reading your poetry, as always. My daughter could certainly relate to this one! Her adorable little brother got a lot less adorable when he could get into her stuff!